America’s Test Kitchen recently held a blogging contest I intended to participate in. But moving trumped blogging. 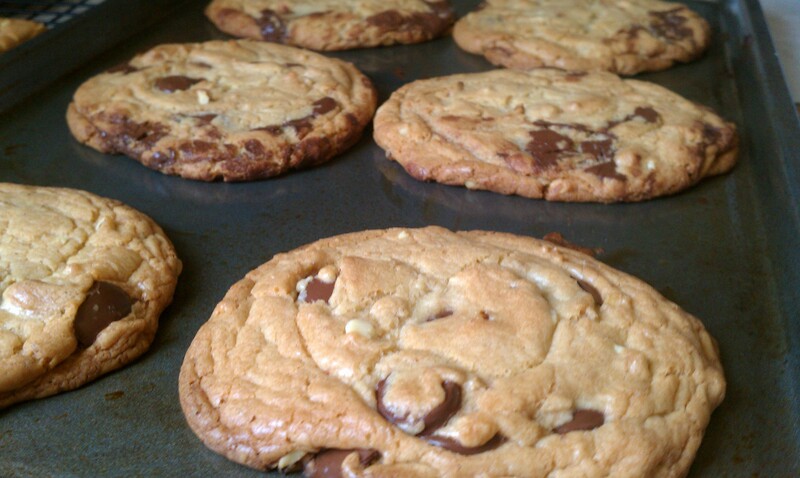 So while I remembered to make the cookies, I completely forgot to blog about them. But I figured prize or not, I’d go ahead and follow through. I CANNOT wait for my cookbook (Land of Plenty) to get here! So anxious, in fact, that I’m incessantly checking the tracking through Amazon. (For some reason I can’t track it on USPS’s site?) Hopefully I can make a dish with the stuff I already have in my kitchen. Who thinks it’ll arrive today? It would probably already be here if it were going to be, right? I just ordered (from Amazon) Fuchsia Dunlop’s Land of Plenty. I’ve read a lot of reviews about the book, and it sounds like it’s amazing. I planned to leaf through the book at Barnes and Noble or Borders before purchasing. But this morning I thought, “What the hell?” And bought it. I can’t wait to try it! Of course, promptly after hitting “submit” I realized I should have checked a few used bookstores around town. Damn it. Oh well, too late. Next time. Hopefully I’ll be able to put together a full meal (appetizer, entree, side and dessert) out of this book for the next dinner and wine night. Katie, Des and I get together every few months. And the next one’s mine to host. Hopefully since I have a decent stock of ingredients from my semi-recent trip to Lucky Market, I won’t have to buy too many ingredients! If anyone’s used this book and has suggestions for what to try (or avoid), let me know. Remember: We’re cooking AND drinking wine. Although, I’ve read the recipes are fairly simple. I’ll keep you up to date on how this progresses. In the meantime, stay perched on the edge of your seat.